Scott Pedder has powered to a dominant victory at Scouts Rally SA, holding his archrival Brendan Reeves at arm’s length throughout the weekend. Reeves held on for second, despite losing a wheel during the final day, while Citroen’s Tony Sullens capitalised on other drivers mistakes to claim third. Pedder’s win sees him leapfrog Reeves in the Championship points, grabbing a slight but significant 5-point lead. “We started Queensland 37 points behind, and after two perfect events for us, and a few small issues for Brendan, now sees us ahead,” said Pedder. Reeves had a rollercoaster weekend, first struggling with setup shortcomings, before suffering two flat batteries and then losing a rear wheel earlier this afternoon. “With all the problems to get second is actually very pleasing,” said Reeves. The wheels came off for Reeves, literally, on Stage 20 through Forties. “The rear left came clean off, we think it broke the studs,” said Reeves. Reeves’ incident saw him drop to fifth for the day, but still able to stay ahead of Tony Sullens in the outright positions for the rally. It proved to be a testing weekend for Sullens too who battled his own setup headaches earlier in the weekend before gearbox gremlins hobbled his afternoon. “On the Manfive stage we only had 1st, 2nd, 3rd and 4th gear, and then on the next stage only 3rd. I could manually select but it took removing the front bumper and removing a clip,” Sullens said. Neal Bates may have again dominated the weekend in the Classics, winning today’s Heat by just over 2 minutes from Porsche driver Jeff David, but the Toyota stalwart insisted it hadn’t been a cruise to the finish. 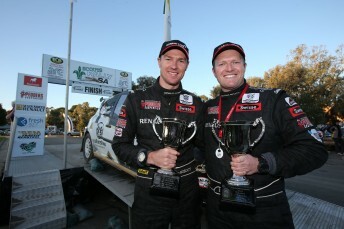 “It’s actually very a very tough rally, with the very wet weather conditions on Friday and Saturday,” said Bates. Yesterday’s drive belt dramas for Cody Crocker and Michael Guest allowed Nathan Chivers to swing home for victory in the Side-by-Side Rally Challenge. The fifth and penultimate Round of the East Coast Bullbars Australian Rally Championship is Coates Hire Rally Australia in Coffs Harbour. The local Round of the World Rally Championship takes place from the 11th to the 14th September.